Wow, you are dedicated, but a great background indeed! PS, any reference to Johnny Cash is OK by me. I love your use of chesnuts in the cream filling. I have ambitions of making a buche, we'll see if it happens before the 25th. mmmm chestnut cream! i love that. happy holidays! Your photos are absolutely beautiful! And the snow is simply stunning as a backdrop for your little log. I love the sound of the chestnut cream too - and the idea of mixing with mascarpone rather than cream. Congratulations on your certificate. Are you continuing next term? Happy Christmas! 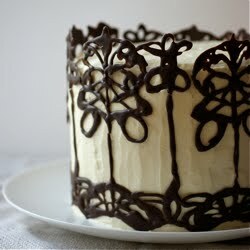 You have definately passed by the looks of your cake! How delicious! And the pics in the snow....from tropical North Queensland, Australia...well, I'm hopping on the next plane! Now that dedication, taking photos of food in -6 degrees!!! 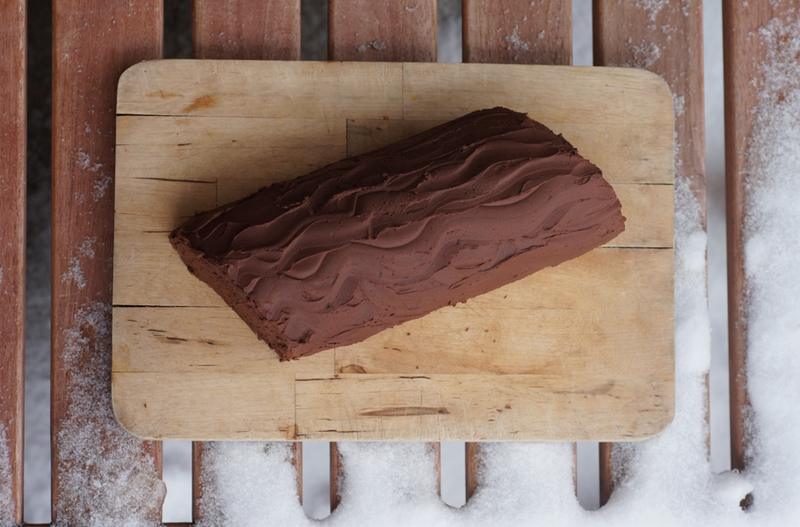 Your buche de noel looks amazing though. I would so love to experience a white Christmas just once, but each year hear in Australia it's hot, well in Queensland anyway, because Christmas day always seems to be 40 degree heat! Marry Christmas to you and your family! Congratulations, Emma, on passing your exams! Merry Christmas! Do you think almond paste would work as well as chestnut puree? Here in Minnesota, USA, I've seen my share of -6 Fahrenheit, but not so much chestnut puree. 1. Congratulations on your passing basic patisserie (though I don't see why you wouldn't!). 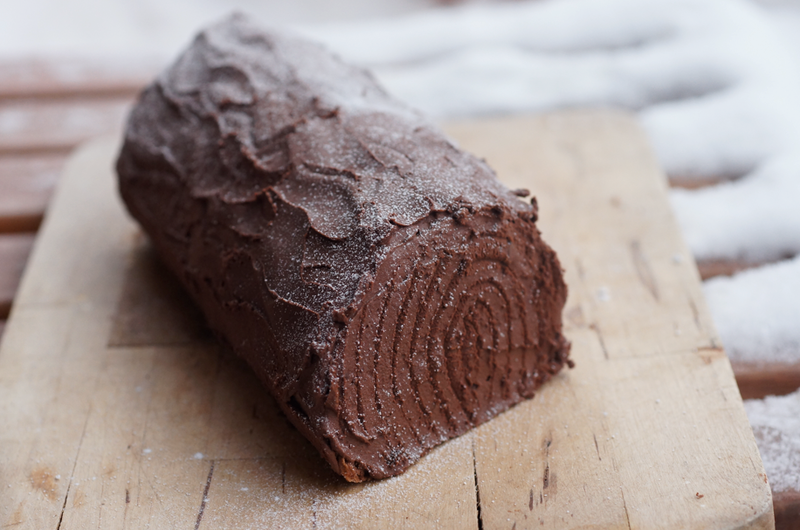 That yule log is perfect - impressive! congrats for your certififcate ! buche de noel looks fabulous & extremely tempting.....happy holidays ! london bakes - Hehe well it was a fun adventure too! Glad you like it. Steph - I love chestnuts, they're so versatile. Happy Holidays to you too! thelittleloaf - I adore marscarpone, it's so thick and creamy and delicious. I was planning to lighten it with whipped cream but it was so yummy as it was (and stable for rolling!) I didn't in the end. Glad you like the snow! Amy - I am continuing yes :) Happy Christmas to you too! Nic - Glad you like it! Jennifer - Hehe well I don't know about all this dedication, I had a jolly time :) I'd like to experience a hot sunny Christmas one day too, maybe we should swap :P Merry Christmas! Daisy@Nevertoosweet - I'm glad you like it :) Happy Holidays! pickyin - 1. Thank you! 2. I like things simple! The snow is lovely. 3. Merry Christmas to you too! Jolene - Thank you! Glad you like the yule log. Hi I found your link on Yummy Supper's blog. 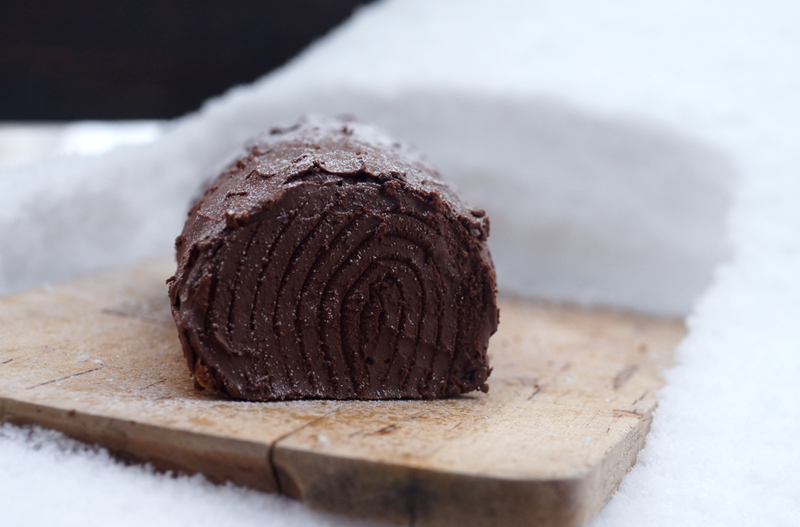 I love your version of the Yule log and lucky for you having the natural icing sugar. I have never shot food outside in the snow, but I totally appreciate that you did it for this recipe! Congratulations on your Pastry Certificate! I did a Cordon Bleu Grand Diplome at the age of fifty, so I know of what you speak. Those practical exams are stressful; in fact we had a pastry chef who kept reminding us that "desserts" is "stressed" spelled backwards. You have such talent and creativity. It was young students like you that kept me inspired as I toiled through my program. All the best in the New Year. whisk-kid - Hehe well sometimes you have to do something silly in the name of food blogging! Emma, big congrats on passing your exam. (I knew you would). 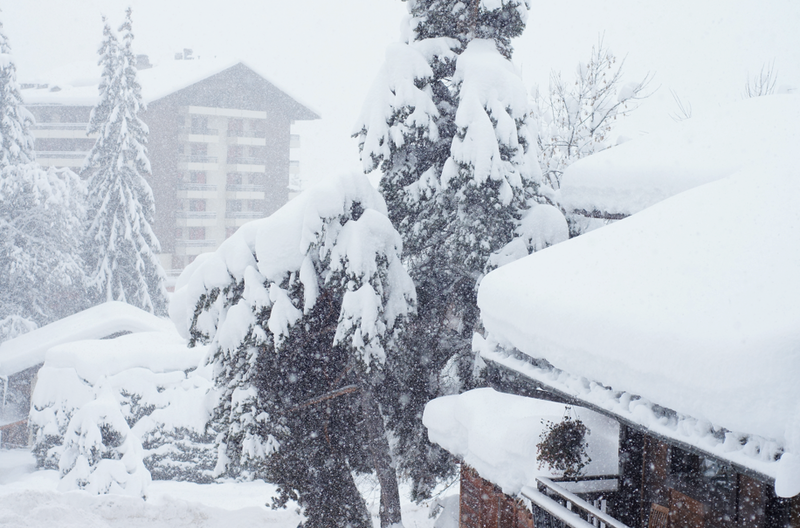 Love the snow shots - well done. 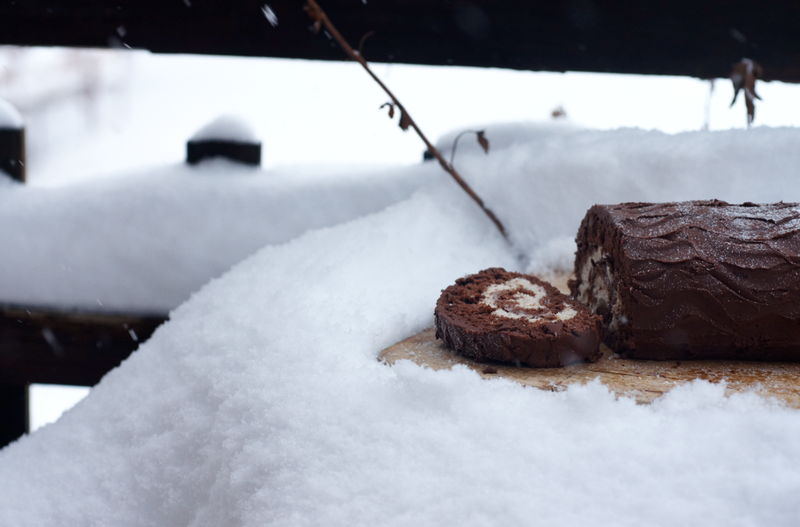 This yule log is so gorgeous set amongst the real snow. There is nothing quite like it, so magical. Beautiful photos! Hi Emma, I'm planning to try this out for Christmas Day this year. I know you said it keeps well in the fridge but was wondering how far in advance I could get away with making it as am working Christmas Eve (boo). Is 48 hours in advance just too much? Hi Nina - that sounds like a lovely idea. I'm afraid I can't clearly remember how many days it took us to eat it, so I can't really think of how it was after 48 hours. I'm guessing it'd still be fine - the ganache will sort of seal it and the filling isn't too liquid so I don't think it'd be too soggy. I might make another one when I go home - if it's early enough that I can check how it is after 48 I'll comment again!